There are two places where you can go rafting in Umbria, the Cascate della Marmore and a rafting centre on a tributary of the River Nera between Spoleto and Norcera. If you are a client of Gorgacce Rentals and would like us to book you a rafting trip we will be happy to do this, simply let us know which house you are staying at and the name of the person who booked it along with details of your rafting group, when you want to go etc.. There are two sorts of rafting at Cascate della Marmore, the high level white water rafting is for people aged between 18 and 55 (16-17 year olds can also go with an adult, ID required) and who weigh less than 100kg. 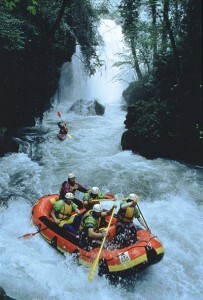 They also offer “rafting soft” along a gentler 5km course of the River Nera, this is open to pretty much anyone. 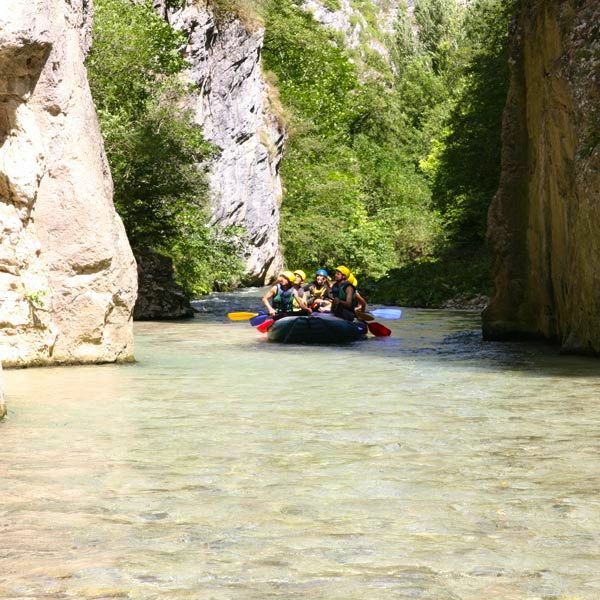 We have been to the second place, “Rafting Umbria” which has a relatively two part easy course that takes around 2 hours travelling 7km down the River Corno and an activity park with rope bridges. You can buy combinations of tickets, we did both parts of the river and our children went on the rope bridges afterwards.